Women's MMA pioneer Yuuki Kondo has announced that she will return to MMA. This was announced by her husband Tetsuya Kondo on his blog and Twitter and reported by NHB News. The couple own and operate the Red Sharks Jiu Jitsu Academy. He trained her when he owned PUREBRED. Yuuki Kondo trained in judo in high school and made her pro debut at the very first women's MMA show promoted by the LLPW women's wrestling company on Nov. 22, 2000. She lost to Marloes Coenen. She was also a regular in the early days of SMACKGIRL. She had planned to continue fighting when she married in 2004. But announced her retirement on Sept. 11, 2004. SMACKGIRL had a retirement show for her on Nov. 4, 2004. She lost to Amanda Buckner. She had one final match on SMACKGIRL's Cool Fighter Last Stand Apr. 30, 2005. She lost to Marloes Coenen. Her record is 11-5-2. Yuuki did get a bit of revenge when she beat Marloes a month later at the ADCC grappling tournament. 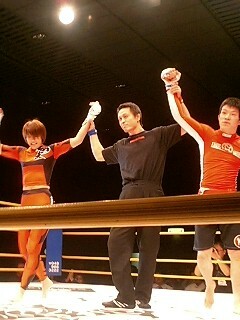 She had one final exhibition jiu jitsu match with Megumi Fujii July 29, 2005. Obviously Yuuki Kondo is still in the martial arts business so I would guess she's in good shape. She's 35 years old and I think she has a daughter. I'm not sure where this pic comes from but her husband posted it on his blog with the announcement. Is Erin Toughill leaving Strikeforce?